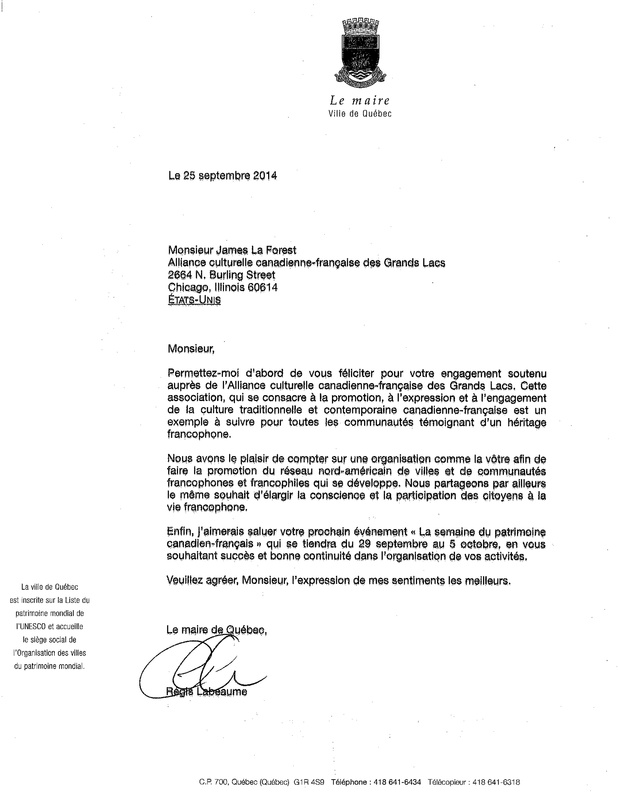 I am very pleased to share the letter below, from the honorable Mayor of Quebec, Régis Labeaume. All of those who take part in French-Canadian Heritage Week in Michigan, through planning and attending events, or by sharing news of our efforts with others, are part of something that is good for Michigan and good for French-Canadian culture. It is an effort being noticed, as evidenced below, throughout French North America. Let’s continue to build in the years to come! My loose translation of the letter follows beneath the image. Mayor Labeaume is heading an effort to form a network of North American Francophone/Francophile cities. For more information on this initiative, click here. Let me first congratulate you on your commitment to the French-Canadian Cultural Alliance of the Great Lakes. This association, which is dedicated to the promotion, expression, and engagement of traditional and contemporary French-Canadian culture is a model for all communities reflecting a francophone heritage. We are pleased to count on an organization like yours to help promote the North American Network of Francophone and Francophile Communities Network as we grow and develop. We share the same desire to expand the awareness and participation of citizens in francophone life. Finally, I would like to commend your next event “French-Canadian Heritage Week” to be held from September 29 to October 5, wishing you continued success for the organization and your activities. Please accept, Monsieur, this expression of my best wishes.